Grillz are one of the most fashionable trends that are currently on the rise. It is a fashion statement that will certainly not go out of style anytime soon. There are so many movie stars who wear them to live broadcasting events and red carpet events. Some of the stars who have been seen wearing gold teeth include the Kardashians, Madonna, Miley Cyrus, Post Malone, and Katy Perry. There are many other celebrities who have seen with sparkling teeth. People don’t want to miss out on the trendiest styles and the celebrities are gladly showing them off to the crowds. This style has even appeared in multiple music videos across the country. But where can people acquire this trendy fashion piece? 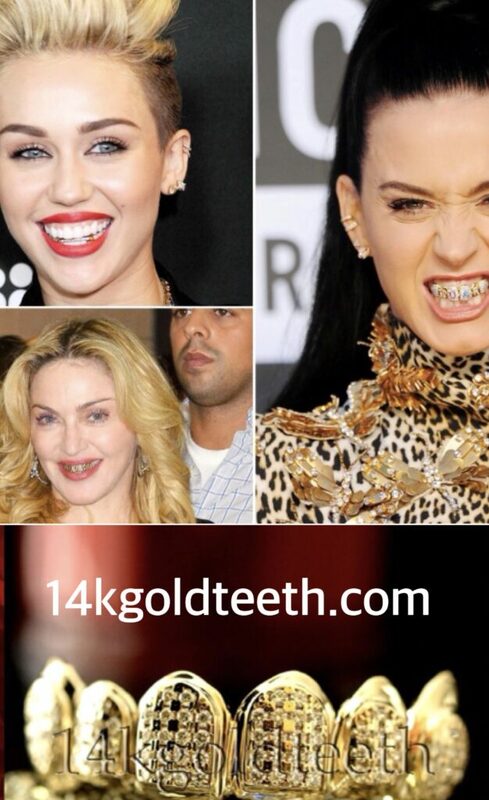 Here at 14kgoldteeth.com, we offer the most fashionable gold grills at the best price. When it comes to picking out your favorite pair, there are endless possibilities to choose from. We offer a wide range of choices from the type of material, design, and number of pieces. We offer different types of metals such as yellow gold, white gold, sterling silver, and plated gold. Depending on your budget, we offer different carats, from 10k to 18k, to accommodate a budget-friendly price point. In yellow gold, we offer 10k, 14k, and 18k, while in white gold we offer only 10k and 14k. Our sterling silver is 100% silver. We offer endless number of designs, but some of our most popular designs include the classic solid, iced out, diamond dust, diamond cut, open face, and bar. We also create custom designs as well to ensure all of our customers confide in a design of their choice. From single pieces, two pieces, four pieces, six pieces, and eight pieces, we offer a wide range in the number of pieces, and customers can also choose the placement of their gold teeth. While some people like having only a top set, others prefer having a bottom set. There are also people who only want the looks of the vampire fangs. Whichever the placement and style people desire, we can do it all. There are so many possibilities, but people may ask themselves “what would be an appropriate outfit or outing that I can wear my new set of grillz?” To help some people who may be confused, we have created a guide to help categorize when you may want to consider wearing your gold teeth. When deciding on what type of gold grills to wear on what occasion, there are three categories to consider: casual, business casual, and formal. The first category is casual. People normally define casual as a normal day-to-day function. This includes grocery shopping, going to the post office, or running errands to various places. Some people may categorize going to their children’s sporting events as a casual activity. Therefore, people would not want to dress in their high end designer dresses or tuxedos, but rather a comfortable outfit that does not restrain movement. Normally, people would call a casual outfit as a t-shirt and jeans kind of event. For this particular category, the best types of gold teeth that may suit the casual wear and casual activities may include the classic solid design, bar design, or a simple custom design. These designs are rather simple, so it will not draw extra unnecessary attention to the mouth and people can comfortably go about their activities. The second category is business casual. This category may be sought with activities that would not be considered day-to-day but rather a weekend only type of event. Some common business casual events include shopping, special sporting events, movies, and work, depending on where you work. With these type of events, people may want to look more composed but not underdressed or overdressed. Therefore, the best types of teeth grillz that are recommended to wear would be the classic solid, diamond dust, diamond cut, and iced out. These types of events would allow for some bedazzle from your mouth as you smile throughout the event. However, since the attire would not be formal, such as a cocktail dress or tuxedo, a more complex design would be acceptable. The final category is formal. In this category, people would consider formal as a once in a while event that does not come upon very often. These events may include movie premieres, parties, date nights, and red carpet events. People tend to dress themselves overly well in formal attire with shiny accessories and jewelry to pull together their entire outfit. As a result, the best type of gold teeth to wear in this case would be anything that involves a lot of bedazzle. These designs include the diamond dust, diamond cut, and iced out. These three designs create an immense amount of sparkle that will be coming from your mouth. With these designs, there will be a lot of attention drawn toward your mouth as everyone will want to see your shiny teeth. These recommendations do not have to always be followed, but it is a guide for those who may be confused about when to wear what type of gold teeth. While some people may enjoy dressing business casual every day, others may be more comfortable in a t-shirt and jeans. The same scenario applies to grills teeth. People should not focus too much on when they can wear certain designs. The classic solid design, for example, can be paired with any kind of apparel. In addition, iced out designs do not only have to be worn with fancy apparel. It can also be worn with a simple t-shirt and jeans. There is not a certain right or wrong way to style your teeth. The way one styles his or her outfit should not matter to others, but to himself or herself. There are endless ways to pair a set of gold teeth to his or her outfit. The final decision comes down to the person and what he or she feels comfortable and great in.